Whether you’re having a wedding, company party, anniversary, graduation party, prom, or any other event, Instant Photo Box is guaranteed to make it fun and memorable. 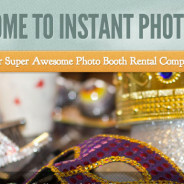 Our Photo Box offers instant high quality pictures in less than a minute. Anyone who has been to a wedding with a photo booth can tell you why they are so wonderful to have. Guests young and old will line up to make sure they have their chance to get a photo and have so much fun they’ll do it again. Go in front of the Photo Box and prepare yourself in front of the monitor.